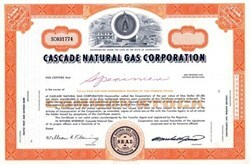 Beautifully engraved SPECIMEN certificate from the Cascade Natural Gas Corporation. This historic document was printed by the Jeffries Banknote Company and has an ornate border around it with a vignette of the company logo with the word specimen written on its face. This item has the printed signatures of the Company�s President and Secretary. Until the early 1950s, Pacific Northwest communities outside the larger metropolitan areas were passed over for natural gas service. 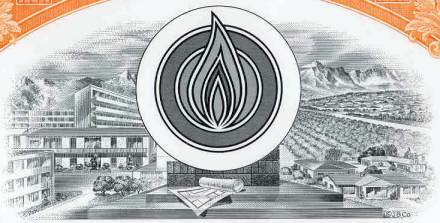 In 1953, Pacific Northwest businessmen Lester Pettit, Spencer Clark, and Stewart Matthews formed Cascade Natural Gas Corporation to serve these communities with clean, affordable natural gas. Today Cascade's 440 employees serve about 210,000 customers in 91 cities and towns in Washington and Oregon. Customers are served from five operational regions,: Western--including Grays Harbor, the Kitsap Peninsula, and Longview; Northwest--including Bellingham, Mt. Vernon, and Oak Harbor/Anacortes; Central--including Sunnyside, Wenatchee and Yakima areas; Southern--including Bend, Ontario, and Baker City; and Eastern--including Tri-Cities, Walla Walla, and Pendleton.